OTTAWA — Justin Trudeau is pushing a proposed new constitution for the Liberal Party of Canada aimed at transforming the federal party from an exclusive club into a wide-open political movement. Indeed, there would no longer be any party members. Instead, anyone willing to register with the party — for free — would be eligible to participate in policy development, nomination of candidates, party conventions and the selection of future leaders. The proposal builds on a change adopted by Liberals four years ago, when they agreed to let anyone willing to sign up for free as a party supporter vote in leadership contests. Trudeau was the first leader elected under the new process, which saw some 300,000 people sign up as supporters. "We've tried the supporter system and it was a huge success," party president Anna Gainey said in an interview. "I believe that as we continue to open up and modernize and have more of a movement than a traditional political party, that this is a natural progression of that." Liberals will be asked to approve the proposed new constitution at the party's national convention in May. While the Liberals look to further open up their party to all comers, the Conservatives are going in the opposite direction. For the current Tory leadership contest, only those who've been party members for six months will be eligible to vote, and the membership fee has been hiked to $25. Each member must pay by cheque or credit card in a bid to prevent leadership campaigns from paying for mass sign-ups of new members. "That is a sharp contrast," Gainey said. Without going into details of the proposed changes, Trudeau championed the need for a constitutional overhaul during a speech Saturday to the Nova Scotia wing of the Liberal party. "We need to be courageous and we need to show, once again, that the Liberal party is not afraid to challenge the status quo, even if it means breaking with our own traditions," he said. "Canadians are counting on us to keep building, modernizing and opening up our movement. We can't let them down." The proposed new constitution would be shorter than the current 81-page document and give more flexibility to the national board, which includes elected riding presidents from across the country, to adapt and modernize party procedures in a timely way. That includes its cumbersome policy development process. Currently, the constitution stipulates that policy resolutions are to be put forward by riding associations for consideration at annual general meetings of the various provincial and territorial wings of the party. Priority resolutions chosen at those meetings are then debated and voted on at the national party's biennial conventions. The process is "inflexible, it is not evergreen, it does not respond to the pace of life in the digital age," said Gainey. The new constitution would allow flexibility to use technology to engage all registered Liberals in policy development between national conventions, reflecting "the electoral cycle that we're in and the environment we're in and the issues that matter at the time," she added. The proposal would also scrap the 18 different constitutions that are currently in play, with the party's provincial and territorial associations and various commissions (youth, women, seniors, indigenous Liberals) each having their own guiding document. Those associations and commissions would continue to exist but there would be only one national constitution for the entire party. The various wings of the party have always jealously guarded their turf and Trudeau sought to reassure them Saturday that the proposed changes "will actually strengthen and make more resilient the close relationship between the federal party and regional partners. 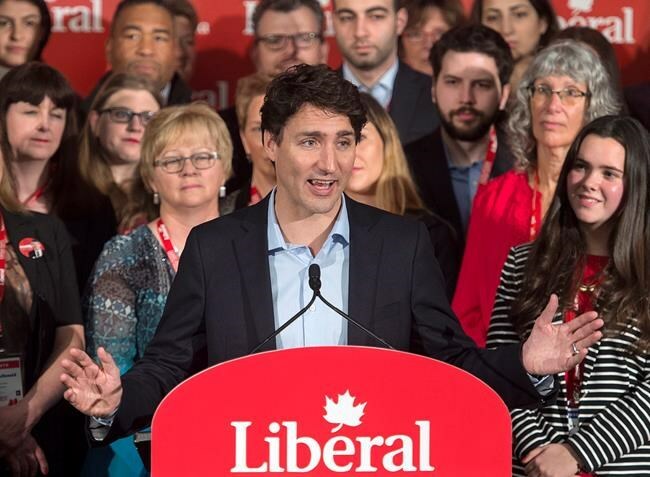 Trudeau has led the push for constitutional change, striking a working group earlier this year charged with "starting from scratch to redesign this party from the ground up," as he put it in an email missive sent to all party members and supporters. He asked Liberals to complete a survey, which the party says some 2,100 people did, and which showed overwhelming support for the kinds of changes now being proposed. When Liberals agreed four years ago to let supporters vote in leadership contests, they balked at similarly opening up the process for nominating candidates to run for the party in elections. Many worried that a wide-open nomination process at the riding level would be too easy to manipulate by political opponents. But Gainey said rank and file Liberals, having seen the benefits of opening up the leadership process, are now behind the idea of doing away with exclusive privileges for paid members altogether. She argued that the party has wasted a lot of time and energy renewing memberships every year and going through the cumbersome riding-by-riding process of electing delegates to attend party conventions, which are never filled to capacity. "Ultimately, I believe a convention is something that should be open to anyone who's interested as a Liberal who wants to participate," she said. "The exercise and the resource that we get sucked into doing (for) these delegate selection meetings, for example, is one example of where we're slowing ourselves down and it's not helping us."